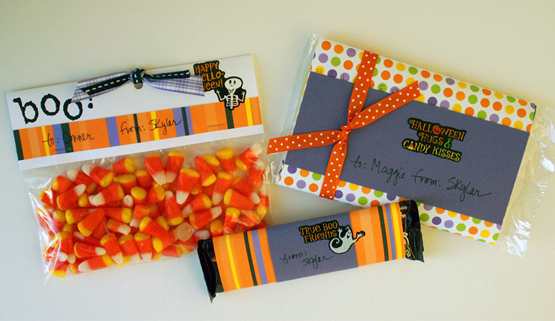 Dress up those Halloween treats for your child’s classmates, friends or Halloween party favors! Make bag toppers for your favorite candies, and wrappers for candy bars and microwave popcorn packages. Wrap the candy and let the kids decorate away! It’s also fun to personalize your fancy Halloween treats with friends’ names. You can also download Halloween printables from the internet in lieu of making your own printables. Heidi Schlabs is a scrapbook/paper craft designer and makes samples for manufacturers in the industry. She also makes cards & invitations for clients. She can be reached at hasstyle@hotmail.com.